$10 Target eGift Card for $7! 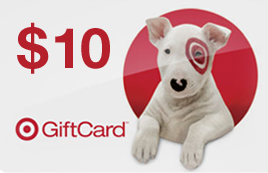 Today you can get a $10 Target eGift Card for $7 from Deal Pulp! It can only be redeemed at Target.com (not in stores). They are no longer offering the $5 credit for new sign ups, but may in the future! I'll let you know when it's available again. The Target eGift Card has NO expiration date! See details here.